« Yesterday Was One Year! OMG! 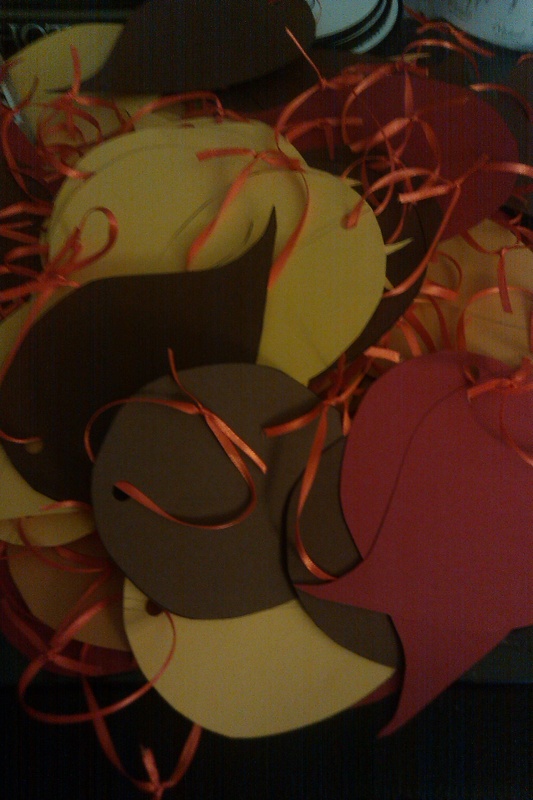 We have been working, working, working on these darned wedding projects. It’s crazy how many hours we have spent tying ribbon, cutting rafia, and printing this or that. The three main projects as of late have been “The Wedding Wishes Tree”, confetti for the ceremony, and bubbles for the reception. The first is an alternative to a guest book in that our guests can “leaf us a message” and hang it on a tree at the ceremony. This was probably the biggest project we have done so far in regards to hours. Creating the tree with our own hands, printing leaves, cutting leaves, and tying ribbon. I thought we would never get done. But here is a close up of some of the ultra cool leaves. The picture was taken with my camera phone so it isn’t the best quality but you get the idea. I am super proud of the way they turned out. The tree itself looks even better but I want to save that for the wedding. Some things have got to be a surprise. Then we had the bubbles and the confetti. The confetti is biodegradable and melts as soon as it gets wet (first rain or with a water hose). We are going to have guests throw it as we walk back down the aisle after the ceremony. The bubbles are really just for fun or for when we leave the reception later that evening (I haven’t decided yet if we will stay and dance late or skip out a little early.) Brandon really helped out with these two projects. Once again, for surprise purposes I will not post any pictures but overall I have become quite the DIY chick. These wedding projects and the whole planning process is quite a huge task though. 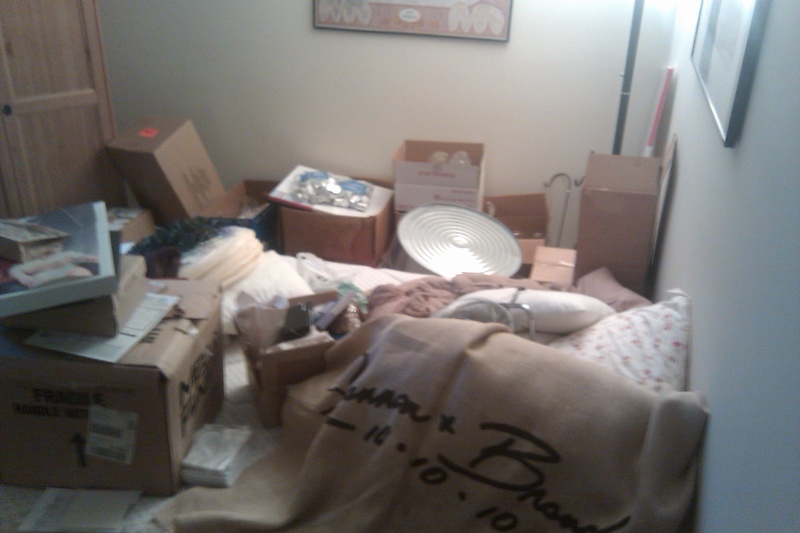 Our apartment has been overrun with wedding stuff. It used to be okay in just the spare room but now it is spilling out into the rest of the house too. I am doing wedding planning on my lunch breaks, my weekends and my evenings. However, with only 55 days left we can’t afford to slack off. Take a look at this chaos! The other side is worse! Anyone who knows me knows this isn’t how I normally function but by month 8 or 9 of planning I just gave up trying to keep order and started throwing it all in a room. I promise to have it cleaned before we have wedding guests arriving though. 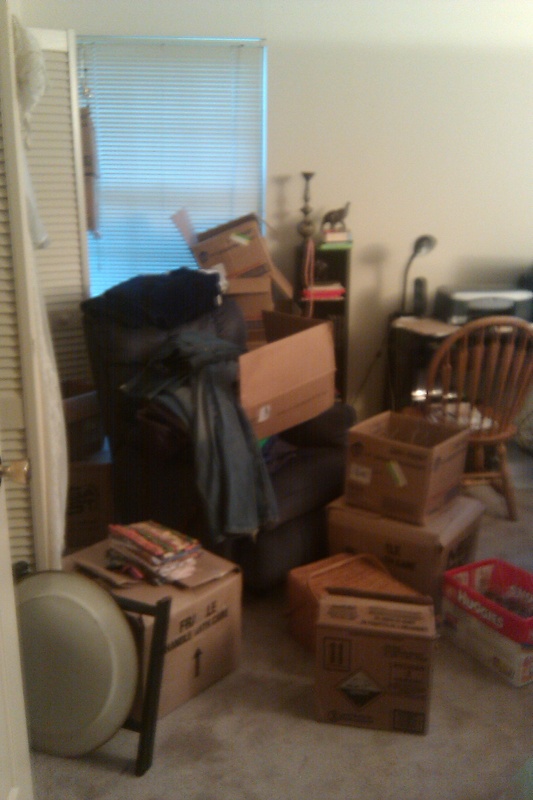 Matter of fact, I have to start cleaning soon just so I can rediscover all I have in there! For all you brides out there, never underestimate the power of DIY…or the mess it creates. The good news is we are getting close. Brandon and I will soon be husband and wife!